Back in the early 80's I had my heart set on a Ruger Security 6 in 357 Magnum. My wallet had other things in mind. Justifying a 22 rimfire handgun was much easier. I needed something to dispatch animals on my trap line. Tired a dragging a 22 rifle around with me, I purchased a 22 revolver. Then in the late 80's, I purchased a Contender in .223 to expand my range on coyotes. Still easier for me to justify than a large caliber handgun. All the justification I needed came in the fall of this year. I found a used Ruger Blackhawk Bisley and set out to learn how to shoot it. The decision on caliber was pretty simple for me. A friend of mine had let me fire his Ruger 45 Colt back in 99 and I was impressed. I could actually hit with it and the recoil did not bother me. Handguns generally make me a little nervous and I guess that is a good thing. It keeps me alert and cautious. I realize that a single action revolver is slow but I would rather have 6 good shots than 10 or 20 bad ones. 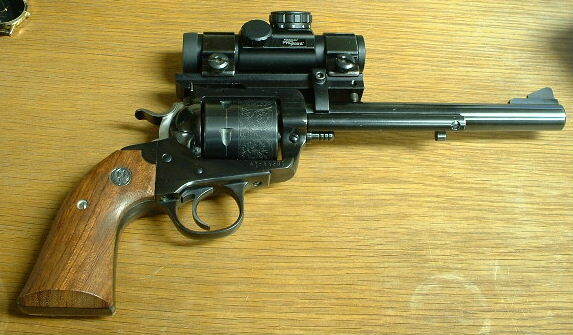 That coupled with the fact that I know nothing about Auto's, I thought it would be wise to go with a revolver. Simple, straight forward and all the stopping power I could get. 90 days later, as I write this, I am very pleased with my decision. I will own an auto in the future but for now, I am learning how to handle and hit with this revolver. I have already lost track of the number of times I have fired it. As of this writing, probably somewhere in the neighborhood of 250 rounds. It is kind of like shooting a rimfire, a lot of fun to shoot and addictive. You should see what it does to hedge apples. Before you know it you are out of ammo.